AmeriTube structures are pre-engineered to be in compliance with the 2001 Florida Building Code; 1997 SBCCI SBC, and the ASCE 7-98 Wind Zones, with Wind Loads of 120 mph, and Snow Loads of 10 psf. AmeriTube frame structures are the only 14 ga., 2" x 3" tubular steel frame systems that are pre-fabricated by welding the main truss components. This ads more strength than the bent or gusset plate assemblies of other tubular steel structures on the market. Standard roof pitch is 3:12 with 29 ga. roof panels applied vertically over hat purlins spaced 32" o.c. with a 3" overhang. AmeriTube's slip-fit connections makes for quick assembly for the professional installer or do-it-yourselfer. 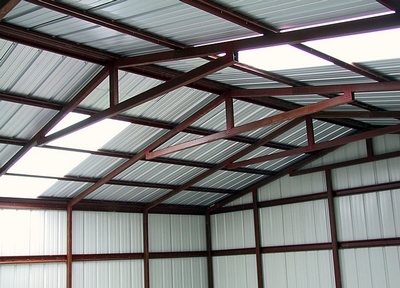 Structures start at 8' wide and increase every 2', up to a maximum width of 40' wide. Lengths begin at 15' and increase every 5', up to whatever length you require. Eave heights begin at 7' and increase every 1', up to a maximum height of 14'. AmeriTube's attractive designs, variety of sizes, affordable construction, low maintenance, building options available, and quality materials and workmanship, can make your next building project a complete success. From the carports to the enclosed buildings, AmeriTube structures are built to last a lifetime.